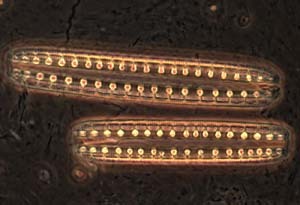 An extremophile is an organism that thrives under "extreme" conditions. The term frequently refers to prokaryotes and is sometimes used interchangeably with Archaea. In this module, however, you will find that extremophiles come in all shapes and sizes, and that our understanding of the phylogenetic diversity of extreme habitats increases daily. 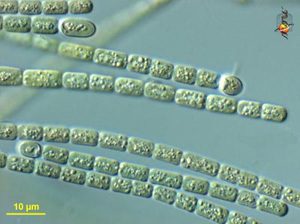 The term extremophile is relatively anthropocentric. We judge habitats based on what would be considered "extreme" for human existence. Many organisms, for example, consider oxygen to be poisonous. While oxygen is a necessity for life as we know it, some organisms flourish in anoxic environments. We call them extremophiles... but that is only one perspective. If they could think, what would they think of us? As you read through the list of terms below, consider how what we think of as normal may seem too extreme from the point of view of an extremophile. Most terms used to describe extremophiles are generally straightforward. They are a combination of the suffix phile, meaning "lover of," and a prefix specific to their environment. For example, acidophiles are organisms that love (phile) acid (acido). Acidophile: An organism that grows best at acidic (low) pH values. Alkaliphile: An organism that grows best at high pH values. Anaerobe: An organism that can grow in the absence of oxygen. Facultative Anaerobe: An organism that grows in the presence or in the absence of oxygen. Obligate Anaerobe: An organism that cannot grow in the presence of oxygen; the presence of oxygen either inhibits growth or kills the organism. Endolith: An organism that lives inside rock or in the pores between mineral grains. Halophile: An organism requiring high concentrations of salt for growth. Methanogen: An organism that produces methane from the reaction of hydrogen and carbon dioxide, member of the Archaea. Oligotroph: An organism with optimal growth in nutrient limited conditions. Piezophile (Barophile): An organism that lives optimally at high hydrostatic pressure. Psychrophile: An organism with optimal growth at temperature 15 °C or lower. Thermophile: An organism with optimal growth at temperature 40 °C or higher. Hyperthermophile: An organism with optimal growth at temperature 80 °C or higher. Toxitolerant: An organism able to withstand high levels of damaging elements (e.g., pools of benzene, nuclear waste). Xerophile: An organism capable of growth at very low water activity.